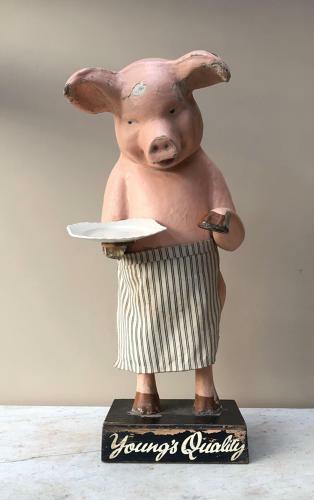 Rare to find one of these (with provinance too).....Large Victorian Butchers Advertising Papier Mache Pig on its Original Plinth "YOUNGS QUALITY"
This pig is called "George" & he stood proudly in "George Youngs Family Butchers" Leeds Road, Bradford. He was in the shop until it closed and then given by the Butcher to the person I bought it offs mother. He said he could remember as a boy the plate being used to display the "Meat of the Day" or used to display notes to Customers as "Happy Birthday Mrs Bradshaw 21 again"
Papier Mache on a wooden plinth. The papier mache is covered by a pink paint which is chipping off in places. The arm that holds the plate has had a repair and a touch of pink paint would cover this. I love George as he is...he is over 100 years old! !